He always dared to dream big. But coming from a middle class family, Shashank N D thought entrepreneurship would remain an elusive dream. The desire to create something on his own and develop easy solutions to existing problems prompted him to start Naabo Solutions while in college. 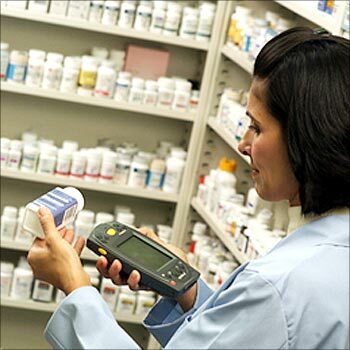 Today, Naabo Solutions offers a cost effective solution for the healthcare industry. Founded by Shashank and Abhinav Lal, Naabo's product TurboDoc.in is an online practice management software for small and medium size healthcare units. It is a SAAS based (Software As A Service) product aimed at managing the affairs of small practices in terms of appointment scheduling, patient record maintenance, billing, accounting and analytics. The process for a clinic to get on board is very simple. The company offers different plans for different enterprises. Starting with Rs 500 (about $10) a month for a small setup to more than Rs 2,500 (slightly more than $50) a month for bigger practices with more features. "The doctors choose the plan and we then install the product in less than 24 hours if there are no custom requirements like data import, screen customisation, et cetera. The product is on the Internet and all it requires is an Internet connection and a browser," Shashank explains. TurboDoc has been able to cut costs, save time and improve patient care. 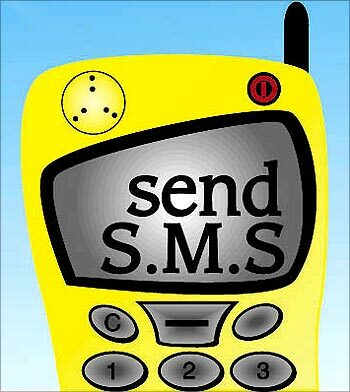 "A good example is our SMS-based appointment scheduler, which sends appointment confirmation and reminder to the patients via SMS. This has helped reduce patients missing their appointments/cancellations and helps provided an easier way to manage appointments for the administrators," says Shashank. Ambitious and raring to scale new heights, Shashank calls his entrepreneurial experience 'addictive'. Tell us more about how you became an entrepreneur, the difficulties you faced in setting up your enterprise? I have always been inclined to think out-of-the-box and had high ambitions. The BTech course at the National Institute of Technology in Karnataka gave me a lot of exposure and involvement in entrepreneurship. 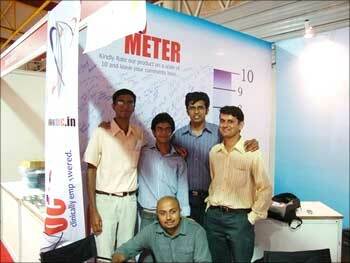 I used to take part in all the entrepreneurial events in college. I was convinced that only entrepreneurs could bring about a powerful change in and a meaningful impact on the society. I was lucky to find a like-minded partner, Abhinav Lal. We both had several brainstorming sessions on what kind of service we should offer. Finally, we came up with a solution for the healthcare sector. So Naabo was born during my second year at college. Since we were in college, we never had any issues setting up the enterprise. We were very eager to start working as soon as we could. 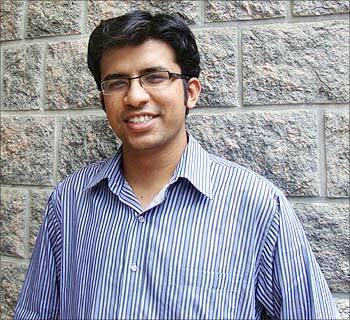 Image: Shashank, co-founder, Naabo Solutions. How did you manage to start a company while in college? Was your family supportive? While in college, we used to work on the product during the weekdays, come to Bangalore during the weekend and sell the product. This is how we managed to survive while in college. We started selling our product/services right from start, this helped us bootstrap. My family has been very supportive right from the beginning. This brought a lot of stability to our firm in its initial days. My family encouraged me to pursue my dreams. However, I did not want to take any financial assistance from my family so we bootstrapped the venture. When did you start? How has the experience been so far? We started work in mid-2007, but it was in early 2009 that Abhinav and I found a way to implement our idea in the form of the current product TurboDoc, which could be monetised and scaled up. I have learnt the importance of teamwork, persistence and discipline working in Naabo. Naabo also has shown me the importance of innovation and how a good vision can lead to a good product and a good strategy can lead to good execution. It has also given me the opportunity to interact and work with few outstanding people on a daily basis. Why did you decide to focus on IT solutions for the healthcare industry? Healthcare in India has been growing at a fast pace for the last couple of years and this has created a big requirement for IT systems to help support and scale up operations in this sector. This requirement is seen at all levels of medical practice, from private practice to hospitals. We see a huge opportunity for quality scalable products to tap into this market gap and our product TurboDoc (www.turbodoc.in) is aimed at doing exactly this. Finance will always be a constraint for a startup and I feel it's a necessary constraint initially. It ensures that the startup focusses on the right issues, right from the start. It also ensures the startup utilises its resources to the maximum while validating their product/service. When we started generating revenues, we decided to raise a small amount of capital from family and friends to scale up operations. 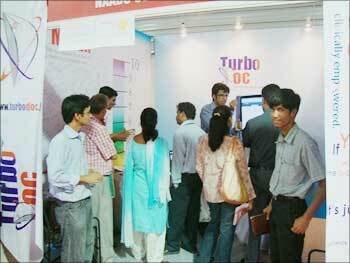 After scaling up, we have been generating good revenues from the sales of TurboDoc. So we are able to cover the expenses of our 10-member team. Do you have plans to approach VCs? Naabo was initially bootstrapped. After a year or so, we did some fund raising through family and friends and continue to be angel funded to date. We are working with our advisors, Morpheus Venture Partners (MVP) to map out a strategy in operations for which we do intend to approach institutional investors sometime next year. 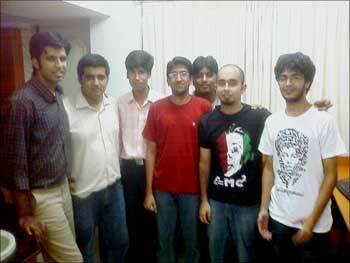 Image: Naabo Team: Aditya, Abhinav, Shashank, Prasanna, Manoj (Lto R). How much have you invested so far? We have invested a lot of hard work and had to make lots of sacrifices. However, I would not like to disclose the amount of capital from friends and family at this stage. Doing business has been quite a steep learning curve for us. There is a balance to be maintained between having an online product and ensuring offline sales and support. In India, since Internet penetration is very low, sales needs to have an offline component to reach the target audience and to promote the product. Another challenge was to make the product very simple and intuitive for doctors, receptionists and administrators of the clinic. How difficult is it to convince people to join a start-up? Our development team is currently based out of Bangalore and we have sales teams in Bangalore, Chennai and Mumbai. We have been very selective in our recruitment to ensure we have the best technical talent from the best engineering colleges in India and the best sales executives from the top B-schools and colleges. It is very difficult to find people to believe in your idea, have the same commitment levels and ability as the rest of the team. Once we find the right people, we go the extra mile to keep them happy and satisfied. Image: Naabo Stall at Expodent 09. How do you manage expenses? Do you take a salary? We are angel funded, we have been generating revenues from the sales of our TurboDoc subscriptions. I have recently started taking a small amount as salary. How's the feedback from doctors? How do these solutions help in cutting down costs? The feedback from doctors, clinic administrators has been very positive. We have been able to move them from a completely paper-based management to a hybrid model, which is a balance between paper-based and electronic form of management. How many doctors are using these solutions? Currently, we have over 250 clinics using our product and more than 1,000 doctors registered with TurboDoc.in. We have been maintaining over 75,000 patient records. We are concentrating on the feedback and are continuously working towards ensuring that their requirements are addressed in the new releases of the product. 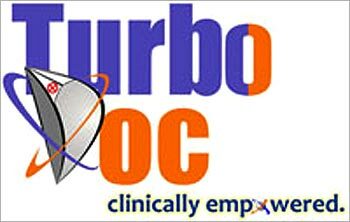 Image: Turbo Doc helping clinics. How do you see the company's growth in India? I see TurboDoc doing very well in all fields of medical and dental healthcare in India. We have a long way ahead but the potential for making inroads and improving both the doctor and patient experience is huge. How profitable is this business? What kind of revenues do you expect? It's a good business to be in as the healthcare sector is expanding rapidly. We are in the early stage so it is difficult to share or project any revenue figures at this point. How do you sum up your experience as an entrepreneur? As an entrepreneur, I feel like a creationist at times. What we as a company built could have a huge impact on the people using it. It can simplify their lives and increase efficiencies in little things. It feels good to hear positive feedback from doctors using our product. Image: A long way ahead to tap India's healthcare sector. How important is innovation for an entrepreneurship to succeed? Did you have any role model who inspired you? Innovation must be coupled with a practical approach to ensure it can be implemented. The innovators at Apple and Google inspire us with their products and services. RedBus.in team is an Indian company, I look up to since they too started young and have been able to solve a common problem of bus ticket booking faced by all of us, which I think is a big challenge. Naabo is poised to be one the leading IT providers to the healthcare sector with an entire suite of products aimed at connecting up hospitals, pharmaceuticals, insurance, manufacturers, distributors, doctors and patients. We aim to make healthcare more efficient by connecting all the players in the healthcare industry. When I find time, I like to read and travel. Image: Naabo is poised to be one the leading IT providers to the healthcare sector.